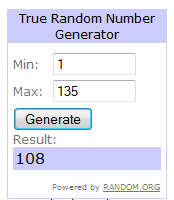 WINNER Sony Noise Canceling Headphones is #108 Susan M! Not yet, but I’ll look into the Chase Sapphire Preferred® Card. I want to very much thank you all for your comments. I hope you take the time to read what your fellow readers have said. There is much good information. The best ones are NOT going for points when they have a home loan or such on the way soon. Well done for understanding your credit is one of your most important assets ( now keep in mind one or two cards a year IMO would still be fine ). I again thank you all for supporting the blog with my links! ← My golf trip to Ft. Myers Florida + another set of Sony Noise Canceling Headphones!